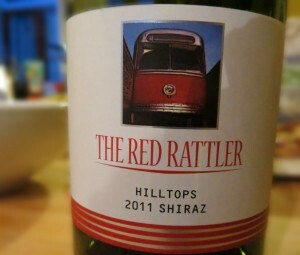 This Red Rattler Shiraz from Virgin Wines has a neat name and a cute label. That doesn’t tend to bode well, money invested in labels and branding tends to be money that could otherwise be spent on grapes. It sells spicy with a little acidity floating about. It’s dry, with quite a high level of acidity with soft tannins. It’s medium bodied, with a medium high level of alcohol, which adds a hint of warmth. The intensity of flavor doesn’t really stand up to the acidity. There’s some dark fruit and a good splash of black pepper, although it doesn’t linger. This wine makes a good choice to drink alongside a robust casserole or a spicy sausage dish, rather than one for sipping on its own.